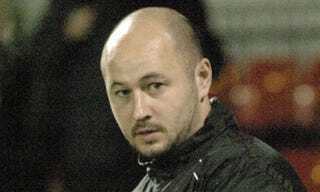 Wayne Thorne was just starting his second season as the manager at English soccer club Larkhall Athletic when he was involved in a head-on car collision. He ruptured an artery in his heart and crushed 16 of his 24 ribs. He punctured a lung and shattered his hip and pelvis. He broke his sternum and his left leg. Doctors elected to induce coma. Mrs Thorne tweeted: "We have told Wayne the score & when Gaz said Lyno scored he opened his eyes." Doctors told her that her husband was lucky to be alive. "Football and sport and being active, that has been his life, so when he was in his coma we were told to talk to him," Mrs Thorne said. "On the first Saturday Larkhall had a game and me and his brother told him the score and he opened his eyes. I know studies have shown that they can hear you and me and his brother truly believe he heard us. It was brilliant to see, because he absolutely loves his football and is so dedicated to Larkhall Athletic."